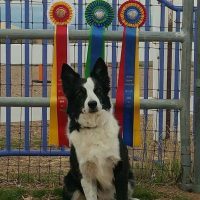 If you are looking for a dog that is beautiful to the eye, athletically inclined and a hard worker then you may want to do some research on the faithful Border Collie. 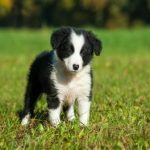 As the 38th most popular dog breed (according to the AKC who officially recognized the Border as a breed in 1995), this beauty is known to work hard for its owner and can be found on many farms. 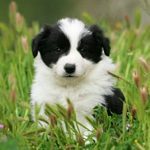 The Border Collie is a medium-sized breed measuring anywhere from 18 up to 22 inches (measuring to the shoulder). The male Collie will likely be a bit taller and weigh more than it’s female counterpart. The average weight of the Collie is 27 to 42 pounds. As a high-energy athletic breed, the Border tends to maintain impressive muscle tone. They are very agile and, with proper training, can prove to be a top-notch ranch hand. The BC can vary in color. There are 17 different color and 7 different markings found in this breed. The most recognizable tends to be the black and white BC with its beautiful eyes that seem to shine. The BC coat ranges from short and smooth up to a medium length with a rough feel. Shedding in the BC is seasonal. Border Collies are all-natural herders. They will herd everything from your children playing in the yard to a bag of oranges spilled on the kitchen floor. Because of these herding instincts, it is important to realize your Collie will definitely need to be taught not to chase cars or bicycles riding past your residence. The Border is very loyal to his family and will tend to follow them anywhere they go within the home. This is a display of loyalty and should not be discouraged. The BC is known for its hypnotic stare utilized in herding. It is said that the Border can entrance sheep and force them to move and/or turn in the desired direction. The Border is known for some rather compulsive behaviors such as chasing its own tail in circles, chasing lights and shadows around the home, or constantly jumping up and down in place. These behaviors are normally displayed in a Border who has not been receiving enough mental stimulation and simply needs something to do. Borders normally get along well with other animals and they are better with older children rather than young ones. 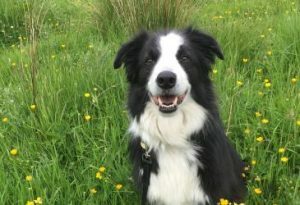 The compulsive need for constant physical movement in the Border Collie may prove to be a bit much for the toddler that is just learning to walk, run and play. It is best to raise a Border in a house with the amenity of plenty of yard space for the Border to get daily exercise. If you live in and apartment and you are able to spend a lot of time outdoors walking your dog and taking it to parks, then apartment living will suffice. The BC is prone to be afflicted by hip dysplasia. Most of the time, this will not pose a problem until the dog is older and begins to move a bit slower due to arthritis (caused by dysplasia related joint damage). Cases are usually diagnosed via x-ray and treated with pain medications but if the case is severe it may require surgery to replace the hip. Borders can also be affected by Collie Eye Anomaly. There are tests that can be done to find out if a Border is genetically predisposed to any of the eye disorders in the CEA group. Epilepsy can also be an issue for the Border. It normally shows up in the puppy stage of the dog’s life. Unfortunately, there are no screening tests that can be administered in order to assess if a Collie is prone to seizure disorders. The Border is well-known as the best breed for herding. The focus of this breed is a definite asset to its employer/owner. One must also keep in mind that a dog that likes to stay busy will find something to do when “life on the ranch” gets boring and are known to wreak havoc during these times. If you are able to keep the Border busy, then this dog is a good match for you. BC dogs require a great deal of attention and patience to teach them to be the trusty companion that is desired. 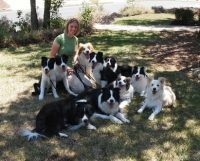 Between teaching the Collie to do chores around the home (inside and out) and taking the dog to obedience training and/or animal sporting events you will find that the Border Collie will repay your dedication with a great deal of loyalty and hard work. 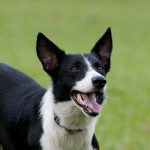 The Short Haired Border Collie: The Right Pet for You?